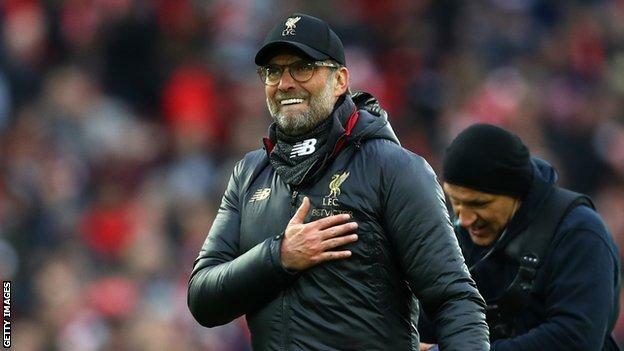 Liverpool are now on 79 points - their best tally after 32 matches of a top-flight seasonJurgen Klopp says his Liverpool team needed "luck" to beat Tottenham, but their "desire and attitude" is driving their Premier League title bid.Toby Alderweireld's late own goal at Anfield on Sunday saw the Reds move two points clear of rivals Manchester City, who have a game in hand.Liverpool are attempting to win their first top-flight title for 29 years. "We compete with Man City; tell me two better teams at the moment, and we compete with them," Klopp said. "I told the boys after the game: There are 500,000 ways to win a football game and today was rather ugly. "But without a bit of luck, you cannot be in the position we are in. We are top of the table. "If we are there at the end of the season it will be down to will, desire and attitude." "Nine months ago, we started and wanted to go for the highest stakes in two competitions. We did it our way. For all the points we have now, we work really hard. "It is not important when you score but what it is on the scoresheet afterwards. Momentum is not a coincidence, it is something you take, you keep and you use. "We get used to situations, bit by bit. The whole stadium... it was the best performance of a Liverpool crowd after an equaliser since I arrived."